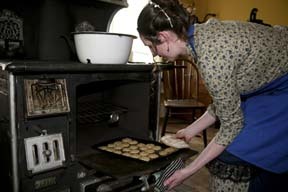 Historic Charlton Park is much more than a collection of old buildings and artifacts. It is a special place made so by the people who bring the village to life. There are dozens of people who devote some of their free time to Historic Charlton Park. Each volunteer makes the Park better by adding their own talents and interests to the mix. Would you consider joining us? There are many levels of participation; one of them might be right for you! If you are interested in history and enjoy conversing with people -- but have limited time -- volunteering for events is for you! 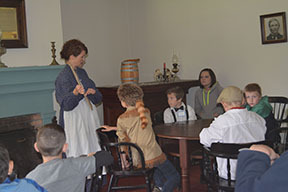 Event Volunteers serve as costumed guides in our historic buildings, answering questions and providing information for our visitors. Event Volunteers are generally committed to one day a weekend once a month during the summer event season. If you enjoy working with children and are looking for weekday volunteer opportunities, help out with our education program presentations! Education Program Volunteers are vital to Charlton Park. These volunteers give half hour presentations on various historical topics to elementary age students. Education Program Volunteers are needed during the week when school is in session, it is a 2-3 hour commitment and you can volunteer as often as you like! Collections Volunteers Are you interested in data entry and computers? Our artifact collection needs to be computerized and photographed. Volunteer as often as you like for as many hours, there is always something to do! Landscape and Maintenance Do you enjoy being outdoors and working in the garden? 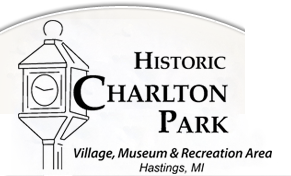 Historic Charlton Park needs your help to maintain our Historic Village and property. Adopt a Building or Landscape and tend your own historic garden or help us paint and do odd jobs in the Historic Village. Volunteers are vital to Historic Charlton Park! If you are interested, please fill out an application online here or download the Volunteer Application. Contact the Curator & Education Coordinator Shannon Pinkster by telephone (269) 945-3775 or e-mail volunteer@charltonpark.org with any questions. Check out our volunteer manual here!